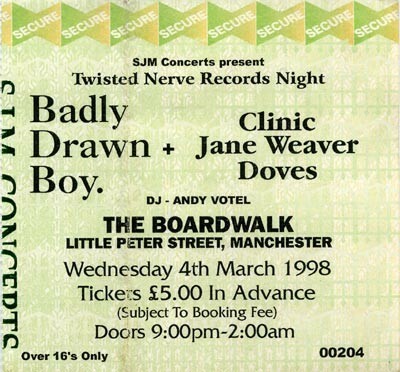 One of Doves earliest gigs (2nd or 3rd?) was this one alongside Badly Drawn Boy and Jane Weaver. I remember Badly Drawn Boy did a version of The Smiths song 'Asleep', watched by Johnny Marr in the audience. Doves were a three-piece live at this point (no Martin), and I seem to remember Jez spending most of the gig doing this tricky balancing act of playing guitar, doing keyboard parts, and triggering effects all at the same time. I remember rubbing up against Bernard Sumner at the bar at this one, kept me in cheapies for the rest of the night. this was doves' second gig (but their first in mcr)... their van was parked in the hacienda, and after the gig they piled all their equipment in the van and locked up the hac doors and went to have a few celebratory drinks. the next day the van was gone and so was their gear! the hac was closed at this point. i later saw jimi's vintage fender jazz bass being shown to a customer (on the day of a guitar show at the Refuge/Palace Hotel) in one of those junk/mag/instrument/record shops- it may have been a brief incarnation of Empire Exchange. It was on Brown St, by the BBC. It became the Occasiopnal Cafe for a while but is now locked up and covered in bill posters. Anyway i phoned Jimi and we managed to get his bass back just in time- it was just about to be sold for £250!